(UPDATE - 12/26/14) With the 2015 NBA All-Star Game heading to New York City, tickets on the secondary market will be more expensive than they have been over the past four seasons. This year, for the first time, the NBA All-Star Game events will be split between two arenas. With the New York Knicks and Brooklyn Nets co-hosting the event, the actual All-Star Game will be played at Madison Square Garden, while the previous nights’ events, such as the Skills Challenge, Dunk Contest and the Rising Stars Challenge will take place at Barclays Center. 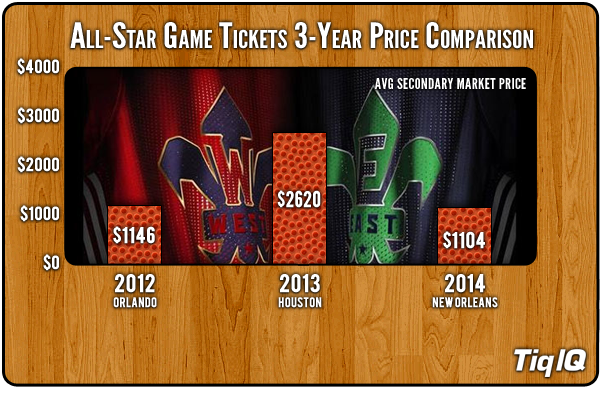 The current average price for NBA All-Star Game tickets is $3,303.91. That price is 224% above the average price from last year’s game at the Smoothie King Center in New Orleans. However, last year’s game was the least expensive since 2011. Still, this season's game will be 26% above the 2013 game at the Toyota Center in Houston, which was previously the most expensive NBA All-Star Game over the past four seasons. 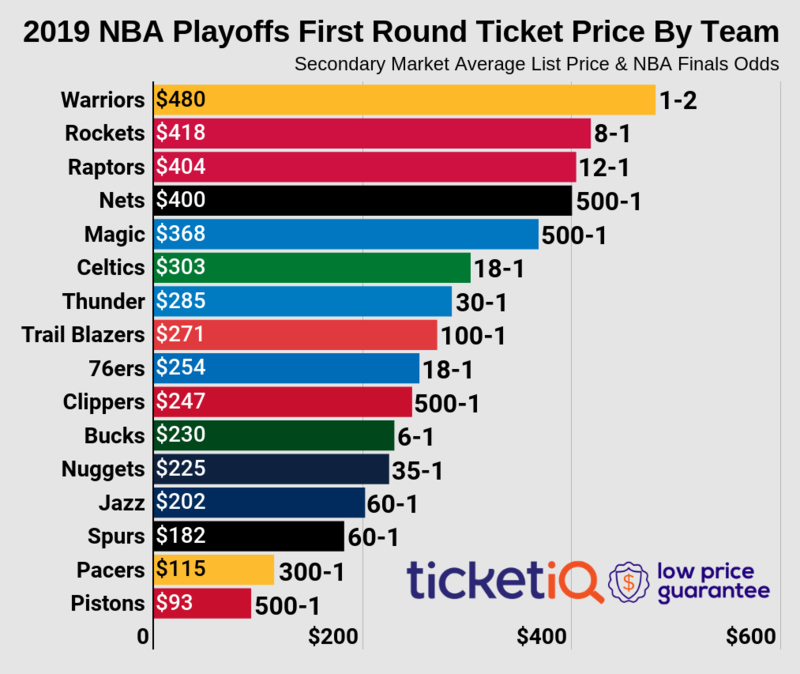 NBA All Star game tickets are usually the most sought after for any sport and while last year’s game at the Amway Center in Orlando saw a decline of 36% in average price from the 2011 game in Los Angeles ($1,720), this year’s game has rebounded quite nicely. The average ticket price for this season’s All-Star Game in Houston has skyrocketed 68% from $1,098 dollars last year to $1,850 dollars today. Comparatively, last season’s MLB All-Star game carried an average ticket price of $870 dollars, while the 2012 NHL All-Star Game checked in at a mere $539 dollars. Much like the Super Bowl, the host city for the game plays a major role in dictating demand for NBA All Star Game tickets. Given the energy surrounding the festivities, NBA All-Star Weekend is always a major draw for celebrities, and historically that draw has been magnified by cities possessing a strong celebrity culture such as Los Angeles, New York, New Orleans, and more recently, Las Vegas. The last time that the NBA All-Star Game was held in Houston, Texas, LeBron James became the youngest player to take home the game’s MVP award at just 21 years of age. On February 17th, the All-Star Game returns to the Toyota Center, as LeBron looks to take home his third All-Star MVP trophy in eight years. Interestingly enough, the 2006 game in Houston was a resounding success on par with any of the aforementioned cities. With a vibrant hip-hop culture, Space City served as a fantastic host for NBA All-Star Weekend and all that it entails. Native Houston rapper Chamillionare had even recorded a new version of his track “Turn It Up” for the festivities, and it actually became the theme song for the event. The 2006 All-Star Weekend was so successful, that this year, Houston will become the most recent repeat host of the All-Star Game and joins Los Angeles as the only repeat hosts in the past seventeen seasons. Given the high profile of this year’s event, it comes as no surprise that the very cheapest seat in the house currently runs a whopping $893 dollars. This represents an increase of 160% over last year’s get-in price of $344 dollars in Orlando. The most recent MLB and NHL All-Star games were relative bargains compared to this game, with get-in prices of $315 and $155 dollars, respectively. The NHL All-Star Game’s get-in price of $155 dollars was actually lower than the get-in price for a handful of regular season games. Of course nobody is going to confuse the NBA All-Star Game with a regular season game any time soon. Last year’s game saw an All-Star record 301 points scored in regulation. While the game itself and all the surrounding festivities are always unpredictable, one thing is for certain—nobody will play a lick of defense, and everyone will be entertained. Are the Golden State Warriors or Cleveland Cavaliers a Bigger NBA Road Draw?